One of the most frequent questions our support staff receives involves extracting pay periods. When your employees clock in and out, all the transactions are collected in a "basket" called Current Transactions. When it's time to do your payroll, your first step should be to separate out those transactions that occurred during your pay period. When you “extract” a pay period, the transactions are placed in a new file, along with a “snapshot” of your company’s policies (overtime, holidays, etc.) that were in effect when the extraction was made. If you don't extract your transactions each pay period, you'll end up with a gigantic, unwieldy list of Current Transactions. For example: If you have 15 employees, each of whom works a five-day week and clocks out for lunch, in two months you'll have accumulated approximately 2,400 transactions. That’s a lot to wade through. You can avoid this problem by "extracting" your pay period. Open TimePilot Central, click "Periods" in the menu bar and choose "Extract Time Period ..." Fill in the blanks on the screen that pops up and click the "Begin Extraction" at the bottom. Now you can work with the data, correcting employee errors and inserting items like vacation pay, before running your payroll. Every once in a while, our employees come across “cool stuff.” This is where they share their finds. Announcing our newest product: TimePilot Vetro! Vetro is our newest, most advanced timeclock. Besides being our first timeclock with a sleek black touchscreen, Vetro is our first product that gives you a choice of using it with your network or as a standalone clock. If you plug Vetro into your local area network, clock-in and clock-out data is delivered to your server in real time for use in our new, easy-to-use TimePilot IV software. If you use it in standalone mode, all you need for the clock is power—no cables. 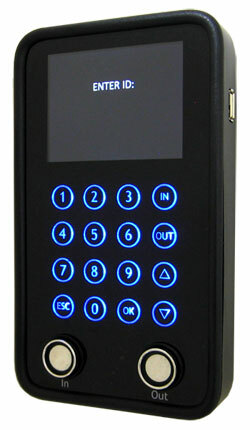 The data is held securely in the clock until you download it to the included USB drive. Plug the USB drive into your computer, and the data is instantly imported into the software. Clocking in or out takes just a tap. 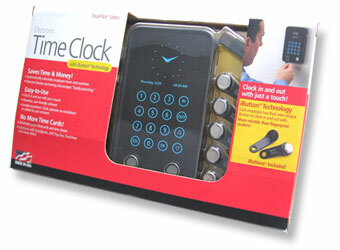 Touch the face of the clock with a finger or an iButton to one of the probes, and immediately the backlit blue keypad lights up. If you're using iButtons, you're instantly clocked in or out; if you're using a four-digit ID number to clock in or out, just enter the number and touch the "IN" or OUT" button. The clock, about the size of a paperback book, was designed and is manufactured by us here in the United States. The new TimePilot IV software is even easier to use than our previous versions. It's also chock full of new features and it's compatible with all 64- and 32-bit versions of Windows, from Windows 7 through Windows XP. Add and edit employees, work with transactions and prepare the data for payroll all in one place: TimePilot Central. Customize the TimePilot Central screen to show only the data you want (dozens of possibilities!). Three levels of overtime; multiple overtime policies and real-time calculation of overtime. Multiple pay types, which can include jury duty, bereavement and paid time off. More flexible handling of breaks. Supervisors can attach notes to any transaction. TimePilot Vetro comes with 10 iButtons and costs just $349. To get the discount, mention that you saw the special price in this newsletter when you call to place your order. For more details, visit www.TimePilot.com or call us at 1-630-879-6400.